This is a beautiful image of a reflection nebula called M78. It’s located in the constellation Orion and is 1600 light years away from Earth. A reflection nebula is a cloud of interstellar dust that reflects the light of nearby stars. The nebula itself is 5 light years across and glows blue because it’s reflecting blue light from young hot stars in the region. Dark dust lanes can be easily traced through this beautiful skyscape. An interesting antidote about reflection nebulas is that the energy from nearby stars are insufficient to ionize the gas of the nebulae to create an emission nebula. However, when you do see ionized gas in a nebulae it is giving you clues that a hot star is entering the stages of a dying star. M78 is a beautiful example of a reflection nebula and is one breath taking image. For more information you can read here or here. This is a beautiful image of a reflection nebula called M78. You could look at this for hours and get lost in this skyscape. 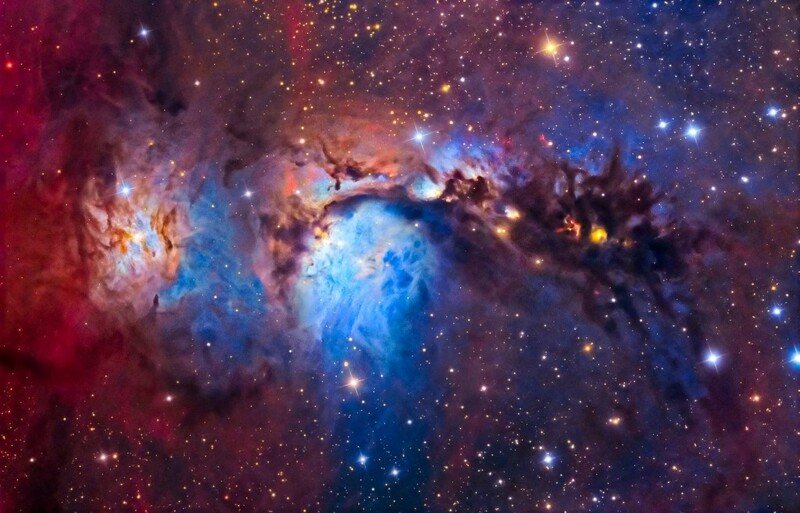 I awoke to the search option: “Google Feeling Stellar”… and, incidentally, because I did indeed wake up feeling stellar… my eyes beheld the image you posted of “Beautiful Reflection Nebula of M78″… I went from stellar to “infinity and beyond”!!! Grateful. Glory to the cosmos, to the multi demential, living and “breathing” Universe! Kind thanks for the digital image that reveals what looks like theological “uncreated light”, a near smear and burst of colored bliss, a gift from the Praiseworthy, the Glorious….